Summary and Definition: The Dawes Act, also referred to as the General Allotment Act or the 1887 Dawes Severalty Act of 1887, was a federal law that was approved on February, 8, 1887. The Dawes Severalty Act was passed to protect the property rights of Native American Indians but the provisions of the law was organized in such a way that tribe members would be assimilated and integrated into American society and culture. 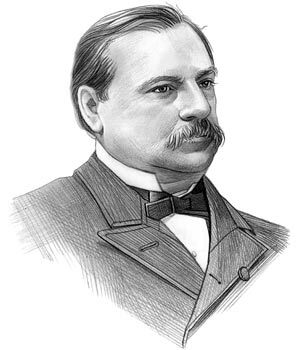 Grover Cleveland was the 22nd and 24th American President who served in office from March 4, 1885 to March 4, 1889 and from March 4, 1893 - March 4,1897. One of the important events during his presidency was the passing of the Dawes Act. The 1887 Dawes Act was entitled an "Act to Provide for the Allotment of Lands in Severalty to Indians on the Various Reservations". The word "severalty" meant that the ownership of land in reservations would no longer be tribal or common, but would belong to an individual. The purpose of the Dawes Act was ostensibly enacted to protect Native American property rights and welfare during the land rush that was anticipated when lands in Indian Territory were opened for white settlement (1889 Oklahoma Land Rush). However, the purpose of the Dawes Severalty Act was also an attempt to integrate Native American Indians into white society by changing their nomadic lifestyle to the static, settled western lifestyle of farmers and settlers. The Indian Policy of the United States government centered on the policy of allotment by which communally held Native Indian tribal lands were divided into individually owned private property. Native Indian lands were seized for settlement by non-Indians and for development by railroads. The 1830 Indian Removal Act had given the federal government the power to force the relocation of Native Indians, living in the east of the country, to territory that was west of the Mississippi River, referred to as Indian Territory, which had resulted in the horrific re-location of the Five Civilized tribes along the infamous Trail of Tears. Congress had created a massive Indian Territory, from Texas to the middle of the Missouri River as can be seen on the above Indian Territory map and about 90,000 Native American Indians had been forcibly relocated and obliged to merge with other tribes. send children to school, drink whiskey [and] own property." The info about the Dawes Act provides interesting facts and important information about this important event that occured during the presidency of the 22nd and 24th President of the United States of America. Provisions of the Act: Each Native American Indian will choose his or her own allotment and the family will choose a land allotment for each minor child. 1887 Dawes Act: Why did the Dawes Act fail? The Dawes Act failed because the plots were too small for sustainable agriculture. The Native American Indians lacked tools, money, experience or expertise in farming. The farming lifestyle was a completely alien way of life. The Bureau of Indian Affairs failed to manage the process fairly or efficiently. Another reason why the Dawes Act failed was because Native Indians were suspicious of the federal government and appalled by previous relocation efforts. The Native American Indians who had refused to submit to previous relocations refused to register on the Dawes Rolls for fear that they would be caught and punished. The Dawes Act was amended in 1891 and again in 1906 by the Burke Act. In 1893, Henry Dawes was appointed to head a three-member commission (the Dawes Commission) to the Five Civilized Tribes to negotiate agreements with the leaders of the Cherokee, Choctaw, Chickasaw, Creek, and Seminole tribes that would end tribal land ownership and give each member individual possession of a portion of the tribal lands. The Dawes Rolls list individuals who chose to enroll and were approved for membership in the Five Civilized Tribes. The article on the 1887 Dawes Severalty Act provides detailed facts and a summary of one of the important events during his presidential term in office. The following Grover Cleveland video will give you additional important facts and dates about the political events experienced by the 22nd and 24th President of the United States whose presidencies spanned from March 4, 1885 to March 4, 1889 and from March 4, 1893 - March 4,1897.